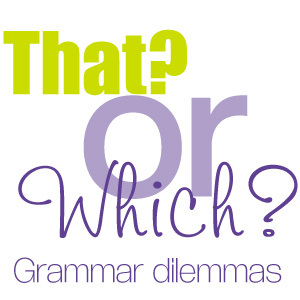 When to use “that” and “which”. He picked the toy that was broken. Dogs that bark are too noisy. The toy was blue. It was removed from the shelf. The toy that was blue was removed from the shelf. He picked a toy. It was broken. He picked up the toy, which had a broken wheel, and examined it. She jumped up and down on the bed, which had squeaky springs, until her head hit the ceiling. The trees, which were green and lush, grew at the back of the garden. Always use a comma before your non-restrictive clause. This defines your clause as extra information in the sentence. I hope this article has helped you. I'm happy to help you too. If you would like me to write, edit or proof-read any work for you, do contact me.